I'm pretty sure that Sunny's is no longer on a "whenever he feels like it" schedule. It is reliably open Friday and Saturday and (I'm pretty sure) Wednesday. There is a great bluegrass jam in the back room on Saturday night. It officially starts at 9, but the best players trickle in from 10-midnight. Sunny's wife, Tone Johansen, seems to run the bar on weekends, but Sunny's makes regular appearances as well. inspired by your Gowanus tour, I hope to head out there this week and snap like mad. Can you comfortably walk from Gowanus to Red Hook? Right, Carol. Just trying to stick to the old historic stuff as usual. The new stuff you mentioned is highly recommended, tho. And you're right about Sunny's, but I sorta feel like a place that's open only a couple times a week is still open basically when the owner feels like it. Ken: If you're a good walker (and I imagine you are) Red Hook is a doable walk from Gowanus. I love these guides. On Visitation Church, since you mention P.C. Keely from time to time, you might be interested to know that he designed the original, in 1854, and when it burned down 42 years later was still around to be hired to design its replacement. But it was one of his last jobs, if not his very last, for he died before it was done, and his son-in-law, Thomas Houghton, completed it. Correcting myself: The original Visitation Church on the site was 1878 as you said. I got my wish. 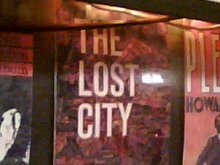 Was at Fairway two weeks ago, saw the "old maritime building" and said to myself, "I wish Lost City will blog about this." It was shuttered down when I was there, it was awfully windy. But in the summer, he has the doors thrown open, with disco music blaring from giant speakers! But I still have not seen anyone, just hear the music blaring! Maybe you'll investigate some more and get his story! Thanks for your blog, I so enjoy reading it. I am very new to the city,and I think you might be able to help me with this. You know there are "metal stars" on the warehouses in Redhook. Do you know what that is called? I will be appreciated if you could reply me. Thanks! The stars are the ends of supportive struts called “tie-rods.” The tie-rods acted as a sort of corset, holding the building together by tying the wood frame and floors to the masonry and brick. You'll see them a lot on old warehouses, because they needed to support heavy materials. The tie-rods often go completely through a building. Many people think the star shape is decorative, a nod to starfish, since these struts are often seen on harbor or waterfront buildings. But this is not so. There are just a lot of warehouses near waterlines. 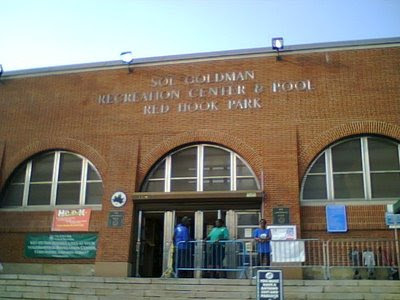 I am the daughter of a Molese immigrant who settled and worked hard on the Red Hook piers. I grew up in Red Hook and am presently keeping journals of the old and new Red Hook as I see it from my life's experiences. I just wanted to comment on what a great job you guys are doing keeping track, researching and disclosing Red Hook's past history and future. 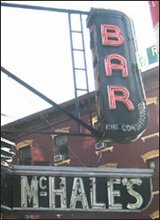 You are right about trying to get the "old timers" to part with their memories if you want a true taste of Red Hook's past life, and about Red Hook's population of Italian immigrants, but they are not from "Mori di Bari" as written, we are in fact from "Mola di Bari". We refer to our city as simply, Mola, and we refer to each other, as a group, as "Molese", pronounced Mol-lay-say. The Molese longshoreman spent many early and cold mornings on Columbia Street under the Columbia Street clock in front of the Happy Hour Theatre between Union and President Streets waiting to be called for jobs along the Red Hook waterfront. (Red Hook, by the way, once was Carroll Gardens, the neighborhood split with Robert Moses' disection of it's core community). The looming, sizeable cranes that adorn the American Stevedoring Compnay at the foot of Van Brunt Street off Hamilton Avenue is what drove longshoreman to Port Elizabeth in New Jersey in the sixties. These men traveled for hours by public transportation to get to Jersey, and in some cases uprooted their families to New Jersey, just to earn a day's work. After purchasing a car, my own father would drive to Jersey and sleep overnight in it to make certain he could work overtime in the evenings, all to put food on the table for his family. And while we were poor, we never starved and ate better then than we do today. Common among the Molese at that time, too, was winemaking and, of course, gardening. It's amazing how they fit it all into their lives. 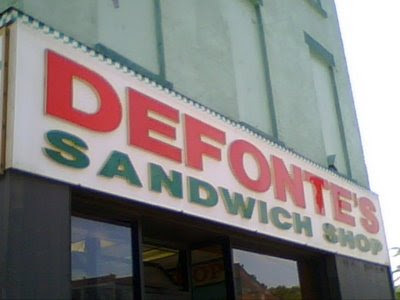 Well, I nkow this is not about the past, but my grandfathers both had restaurants in the neighborhood. "Pop" owned a place called Economy Lunch on Summit St that served the workers building the Battery Tunnel. After the tunnel opened, and lunch traffic slowed, he closed and went to work int he paint factory across the street. My Great Grandfather, who I never knew, had one of Brooklyn's first Pizza shops on Van Brunt St near President. It was called "Pop's Pizza". If anyone has any pictures of these places I would love to see them. I was born on Conova Street 77 years ago. I grew up when it was so beautiful. I remeber my mother taking us kids swimming of the Coffee Dock in the summer. I started working when I was 16 on peir 36 as an extra labor. and from there I joined the Army during the Korean Conflict. When I returned home I use to work for Tony Pimpinili, he was the hatch boss. From there I married and we stayed in the Hook for quiet a while, them moved to Long Island. Then I retired in Arizona. I grew up in Red Hook and have fond memories of the neighborhood as I was growing up. Although I saw my school, Patrick F. Daly School, renovated, the houses along Conover Street replaced by newer buildings and the empty parking lot on Wolcott street turned into a complex, i realize that change is inevitable evn if I don't exsactly like it. I found an old crockery gallon jug that has Puziello Luccaro & Co Rectifiers 110 President Street Brooklyn stamped on it and wonder if you have any information on this company. I have an old crockery gallon jug that has printed on it Puziello Luccaro & Co, Rectifiers, 110 President Street, Brooklyn. Do you have any information on this company? Toni Geiser: Yes. My information for you is: I want to buy it! Seriously, would you consider selling it?